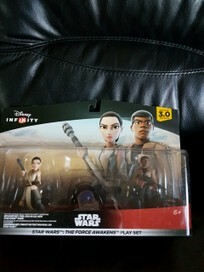 Disney infinity 3.0 "Star Wars Set" - the force awakens- comes brand new never opened or used so it's in excellent condition and compatible with all Disney infinity gaming bases. Contact and payment is to be made within 3 days of winning the auction. Check out my other listings for more Disney infinity stuff.